Double layer of compote. Thick 'n' creamy. Natural ingredients. British milk. Gluten free. Vegetarian friendly. We gotta warn you, this ain't any old plum yoghurt, oh no it's not. 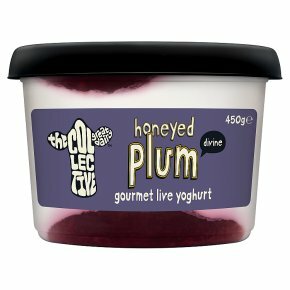 An enchanting plum compote with golden blossom honey surroundin' our thick 'n' creamy yoghurt... This is a taste experience that can only be described as heavenly, no bull!